Fall has arrived in North Texas! And finally, so has the September Newsletter. (Yes I know it's much later than normal.) While meteorologists use a definition based on Gregorian calendar months, with autumn being September, October, and November, the autumnal equinox (the date when the amount of nighttime and daytime (sunlight) are roughly equal to each other) occurred on September 22nd at 8:54 P.M. CDT. But since football season is now in full swing, and the State Fair of Texas opens on September 28th, I think we can safely assume that the warm temperatures of summer are past and cooler weather is on the way. 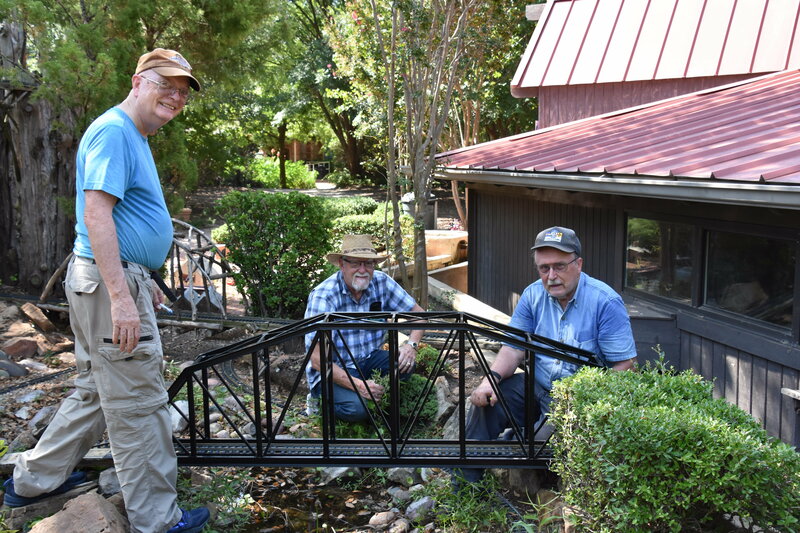 The warmer temperatures did not deter the Club’s support for Clark Gardens however, as our members helped to upgrade their existing outdoor layout, as well as running our trains for their annual Model Train Show over the Labor Day weekend. 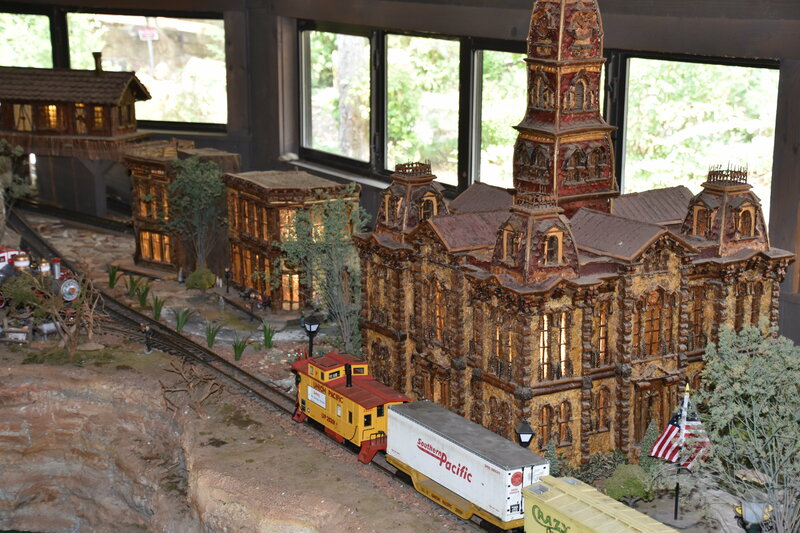 Read on to find out what was done in Mineral Wells, as well as the activities for our next September event – the Fall Plano Train Show. 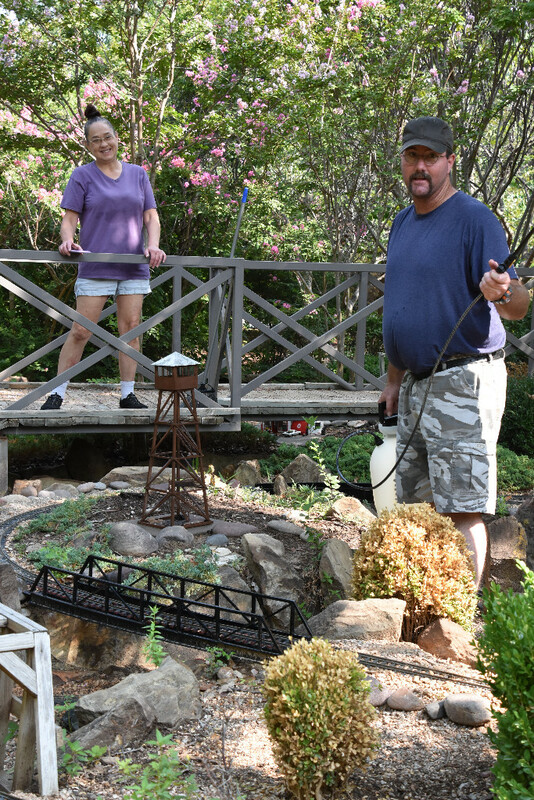 The Club did its annual Labor Day weekend Train Run at Clark Gardens in Mineral Wells. We had a great turn-out for set-up and tear-down. 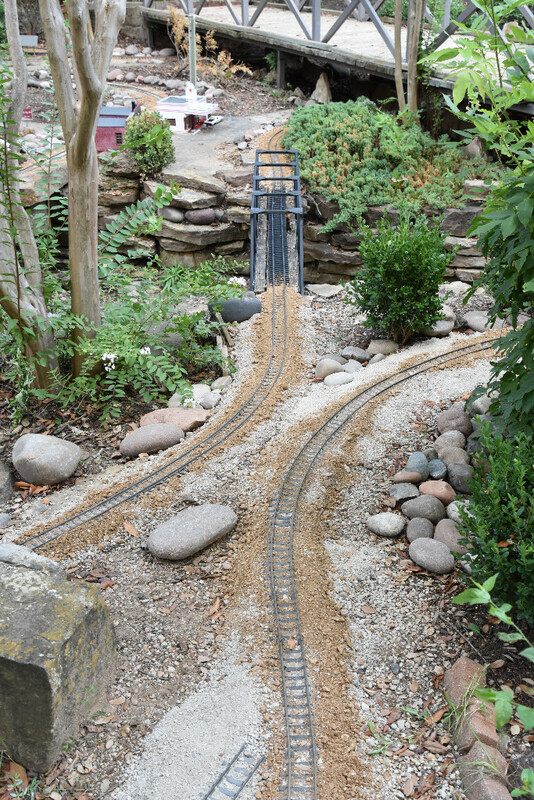 Lots of track time was available to run trains as many time slots did not fill. It was just tad bit warm and the humidity could have been a little bit lower for comfort, but all seemed to survive. We went to a no host dinner at the Mesquite Pit BBQ and Grill in Mineral Wells. Oh my Gosh, they had a new hors d'oeuvre called Armadillo Eggs. I filled up with two of those and two sausage discs and one hundred and one glasses of cold water. I ended up taking my smoked sausage dinner home. Made three great sides to breakfast on Monday, Tuesday and Wednesday. Speaking of breakfast, many of us stayed at the Best Western. Those who listened to their great and fearless leader (me) and made reservations really early got $59.00 a night reservation. One club member waited until the last minute and paid $79.00 for Friday night but when a room opened up for Saturday, they wanted (hold on) $199.00 for one night. (prices are computer generated by corporate and local management has little or no control of them - so I was told). I have already made my reservations for 2019. Please do the same - you can always cancel. 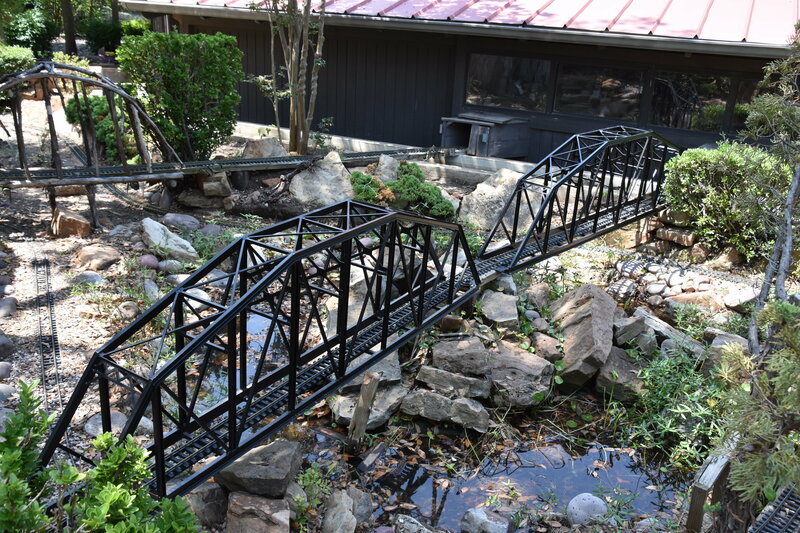 Call the hotel directly: 940 325-2270. Saturday night, all who wanted to go went to the dinner hosted by Clark Garden’s - Max Clark and his daughter and General Manager. All enjoyed a wonderful plated and served to the table Central Mexican dinner. Appetizers were chips and a wonderful freshly made salsa. That was followed by two chicken and two beef Pastor seasoned tacos, refried beans and seasoned rice. Dessert was two long Churros. They were so big that I cut them into two pieces and slipped two of them to Ryan Reed’s plate. That boy worked very hard and must also have two hollow legs. 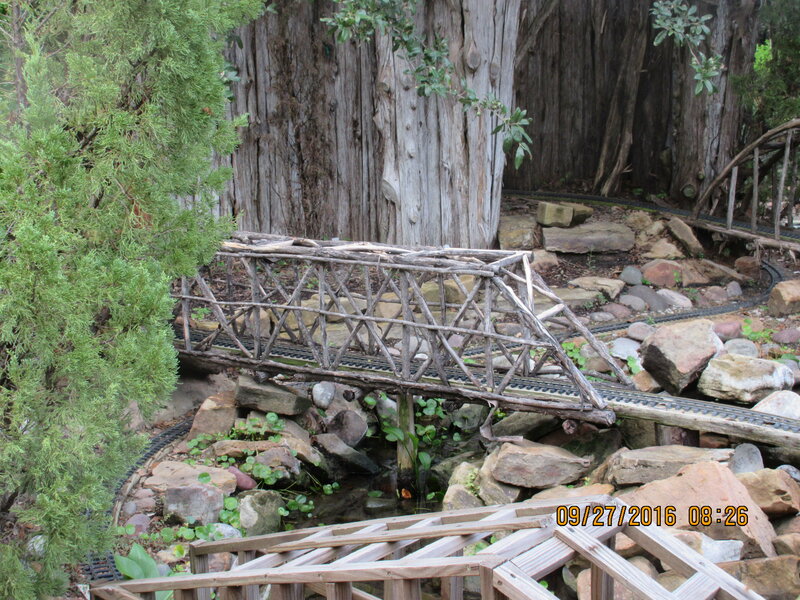 We accomplished a lot during the Clark Gardens set up day: We did a complete track inventory, and re-crimped all the track joiners. We also emptied out the trailer, then blew it out, fixed loose floor tiles and refastened wood wall strips (thanks J.C. Greenlee). 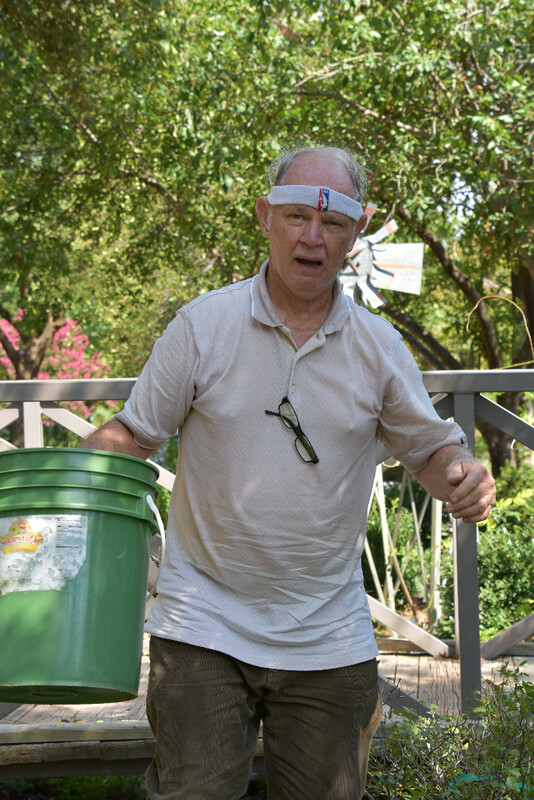 We then went through storage bins and threw away junk and debris on the bottom. I know that does not seem like a lot but it was a man hour job. While this was going on, the carpet for our layout was laid and vacuumed. Then we started to set out track and have a wonderful two days of comradery and train run time. 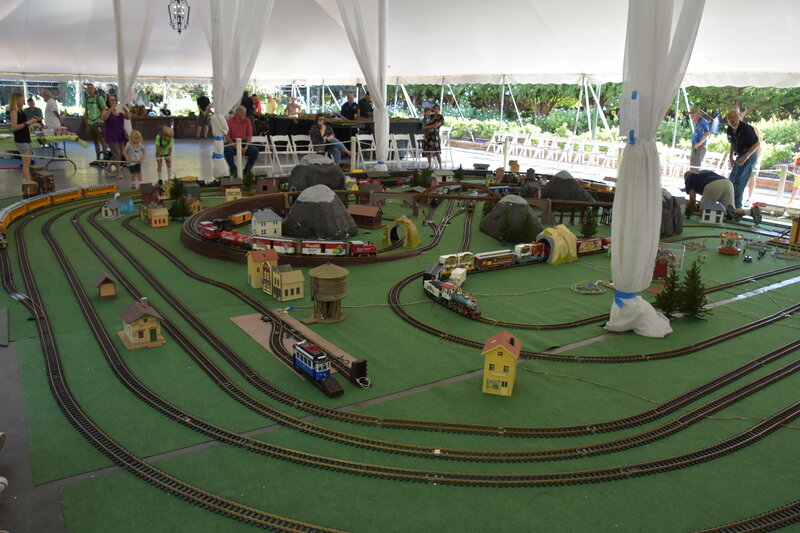 Below are some pictures of our layout at the Garden's large tent. 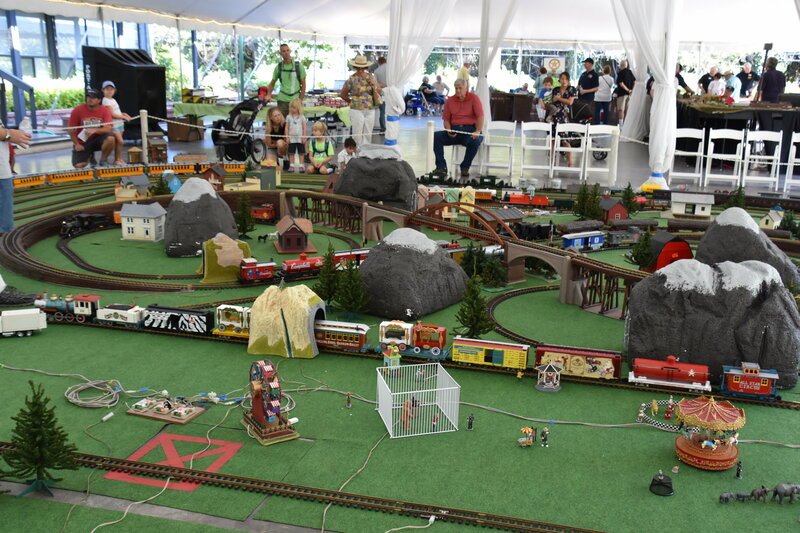 Coming up next weekend is the Fall Plano Train Show. Click HERE for details. The Rail sign-up sheet has been released via email so please sign up if you would like a time to run your trains. After set-up on Friday September 28th, there will be a no host dinner at the Bavarian Grill. This will be an open menu with the club receiving a 20% discount. Food will be brought out as it becomes available (the order will be turned in at one time for all seated-on time) by runners so that it is still hot. DO NOT WAIT FOR ALL TO BE SERVED. Dig in and enjoy. Dinner will be approximately 5:30 PM. I will make reservations based upon the number of members that reply that they would like to attend. The dinner is open to all members whether you help set up or not. We know that some of you still are gainfully employed. 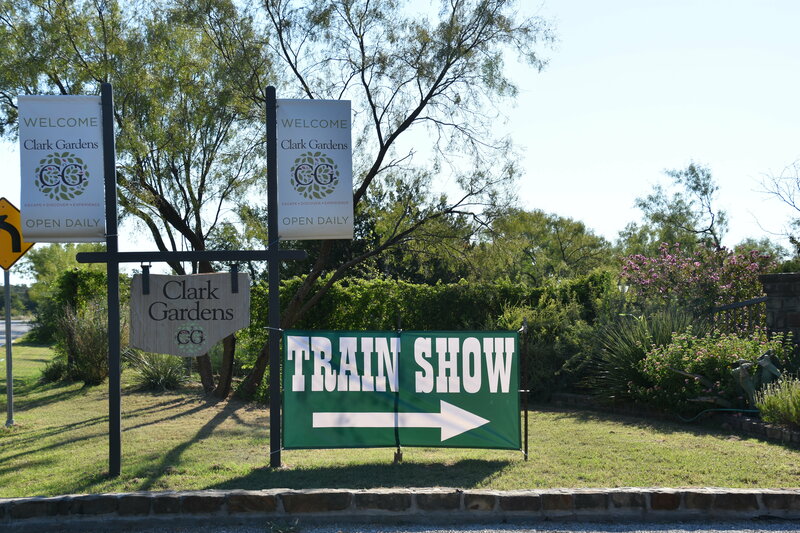 As readers of this newsletter know, the club has taken on assisting Clark Garden’s to support the effort to maintain their trains. 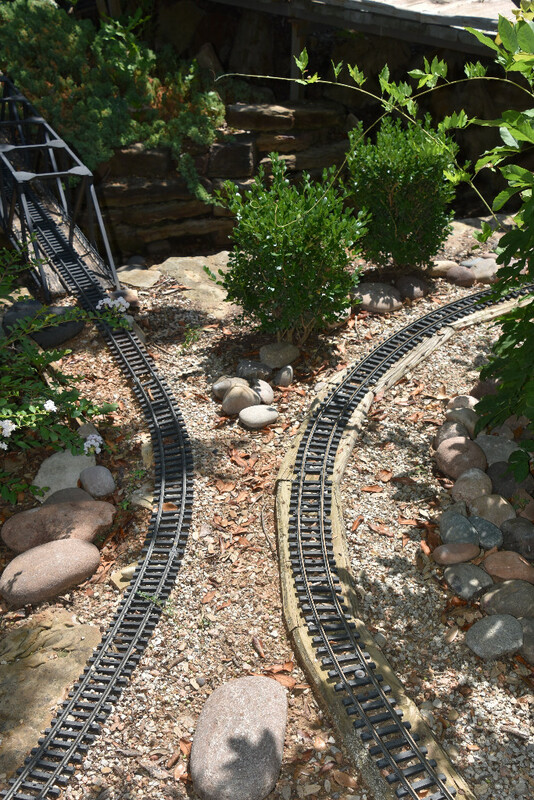 (Click HERE for details on Clark Gardens) The Garden’s has four loops of G Scale outdoor track, and two Lionel loops, along with one HO layout, and one Z scale layout inside the train house. All but the HO layout, were ready for the Train weekend on September 1st and 2nd. 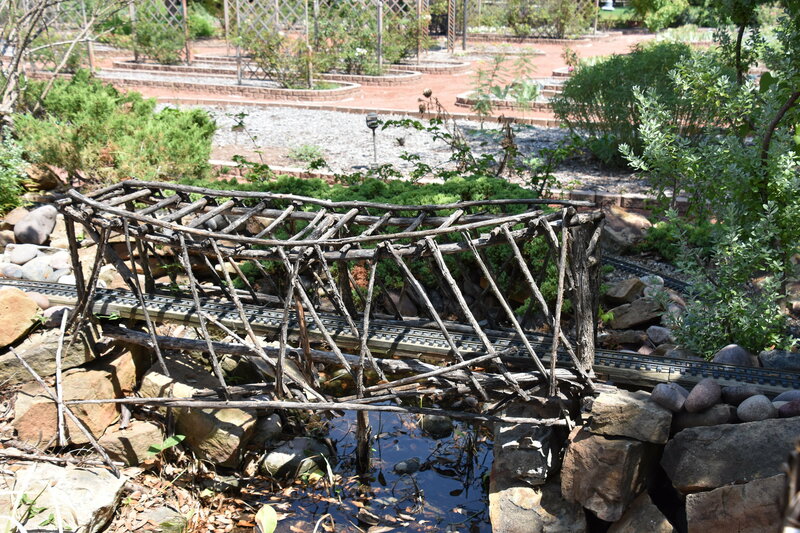 Several long overhead bridges were reinforced with new metal supports and several old wooden bridges were replaced with new metal ones.There are still two or three old wooden bridges left to replace as soon as new bridges are manufactured. Lots of outside buildings have been re-glued together and re-painted and set back into place. 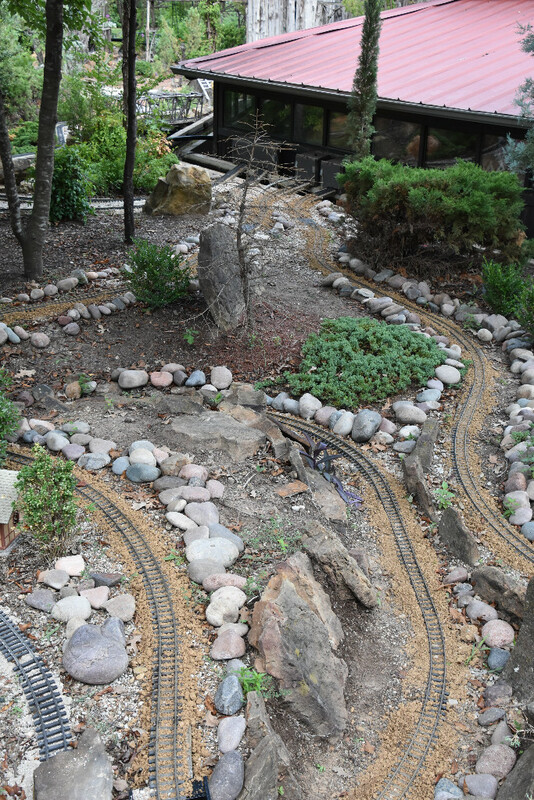 Erosion has been slowed by installation of larger river rocks and then a roadbed mix of backfill put behind the rocks. Decomposed granite (DG) has been laid on the rail beds. 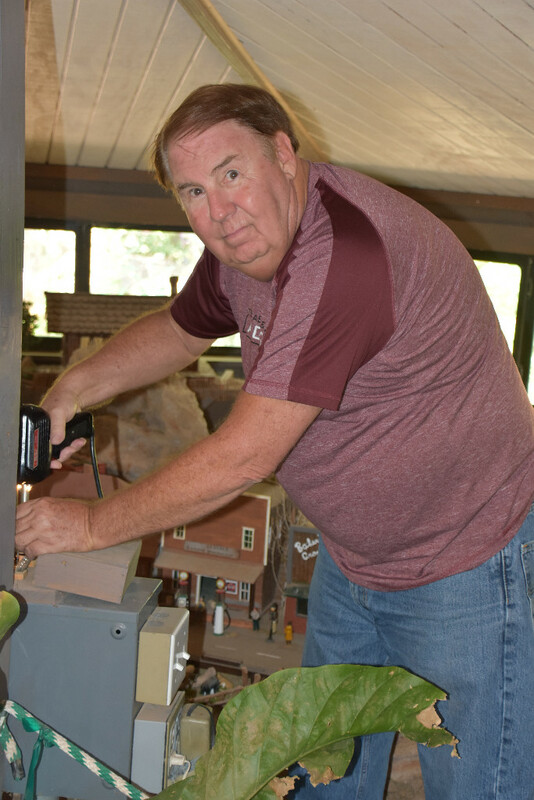 The train house has been converted to almost 100% LED lighting (one work room left to convert), reducing both heat and electric costs for the Garden’s huge electric bill. With three exceptions, houses in the train house have all been converted to LED lighting illuminating the windows of those buildings. 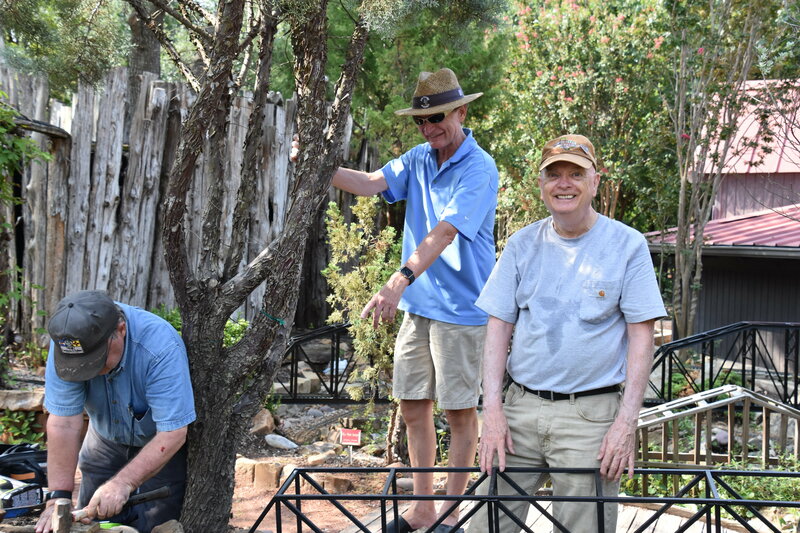 The pictures below show several of our members working on the Garden’s permanent outdoor layout as well as some before and after photos of what was accomplished. Trainhouse Display with LED lighting. 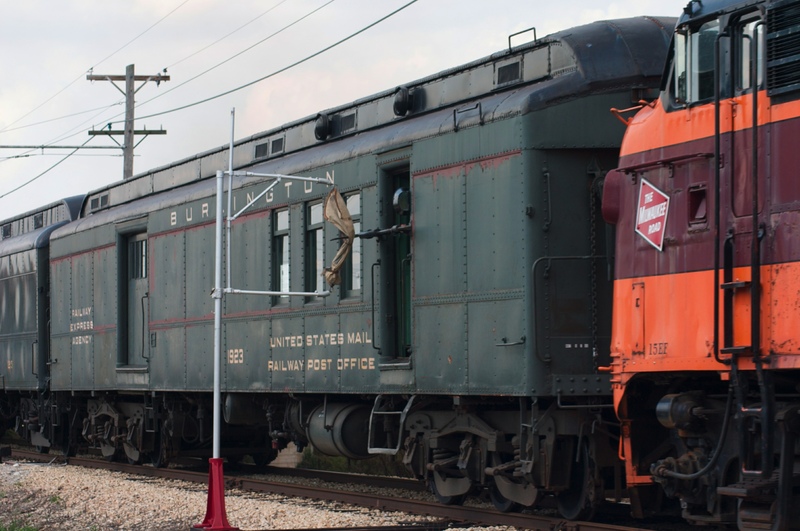 Cumbres & Toltec is coming to Texas. Yes, the Friends of the Cumbre’s & Toltec is coming to Austin on 4 May 2019. Click HERE for details about this organization. In 2013, Tim and his presentation came to Rusk, Texas. 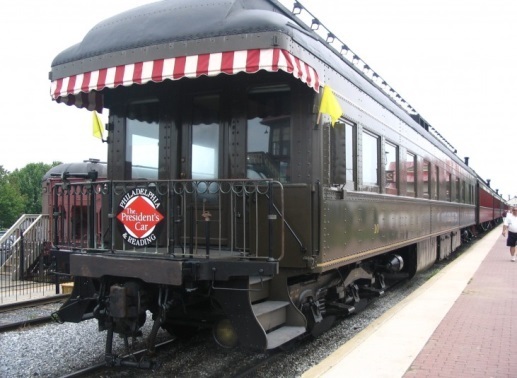 That is where I first heard about how the Friends of the Cumbre’s & Toltec support the 64-mile scenic railroad. It is why I joined the group and also why a couple of our members go out in June and July to the work sessions every year. Our club has voted to support this valuable organization. In 2013, they did a 55-minute presentation, fed us a terrific Texas style BBQ of Brisket, BBQ chicken, Sausage, Chicken and Beef Fajitas, Sides of corn on the cob, BBQ beans, Cole slaw, finished by peach cobbler with ice cream. The end of the afternoon was a special steam locomotive driven train ride and 3 run-byes, with a visit to the oldest working steam powered turn-a-round in Texas. Location and time to be announced. Let us go as a large group from the Best Club in Texas. 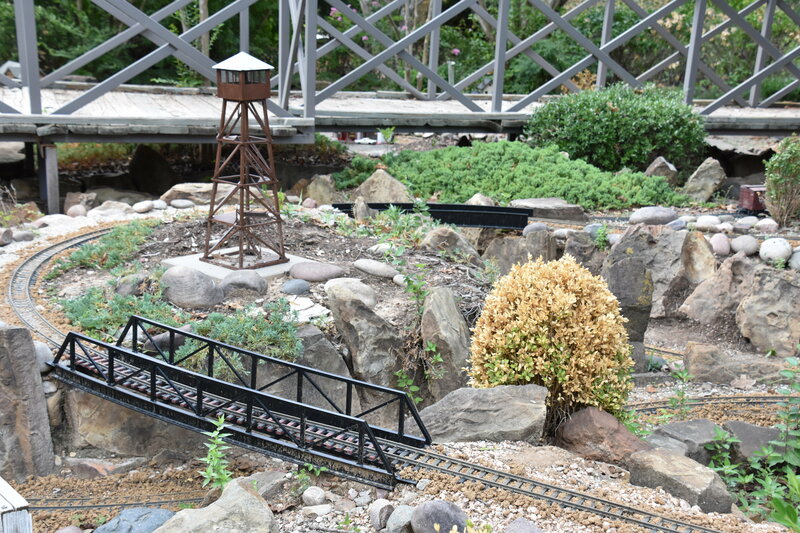 NOTICE: The NATIONAL 2019 G SCALE GARDEN RAILROAD CONVENTION IS BEING HELD August 26th through the 31st, 2019 in Portland, OR. Click HERE for details. 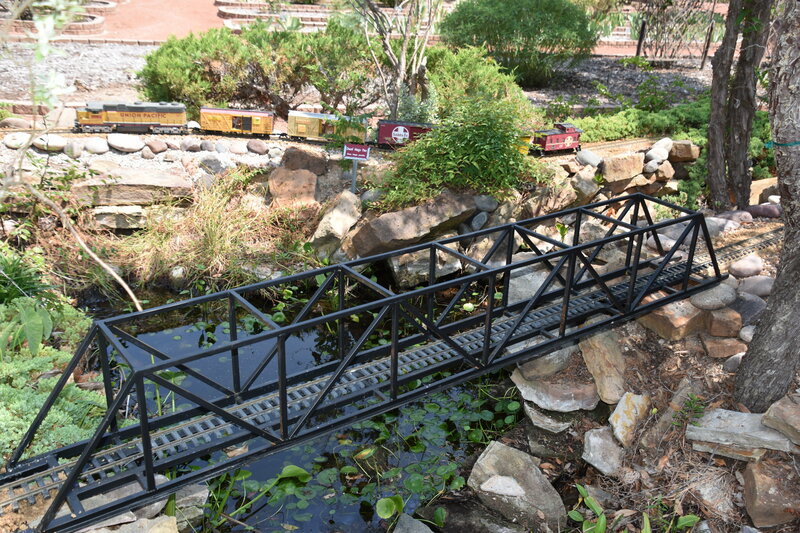 It does conflict with our club commitment of Running Trains at Clark Gardens Labor Day weekend 31st Aug and 1st of September. Set up is the 30th of August. Reminder: Your 2018 Dues are still only $25.00 for this year AND a Life-Time Membership is still only $250.00. Those Life-Time memberships make a wonderful gift. There are still a few members that have not renewed from 2017. 2017 gave us the highest membership numbers ever in the history that we have on record for this club. My hope is that we get the highest number of members ACTIVE (at least a couple of times) this year. Mail your dues to Pete Dahlberg, 4519 Willow Bend, Arlington, TX 76017 . 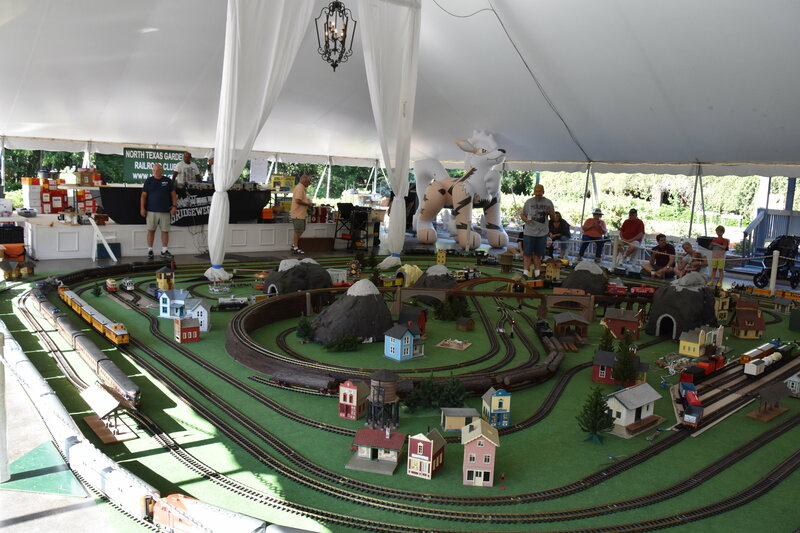 September 29th & 30th Plano Fall Train Show, 2000 E Spring Creek Pkwy, Plano, TX 75074. Set up September 28th approx. 1:00 o’clock PM. October 21st Home meeting at Dave and Cindy Valdez, 129 Hidden Valley Airpark, Shady Shores, TX, You can drive or fly-in for the meeting at 2:00 o’clock PM, your choice. 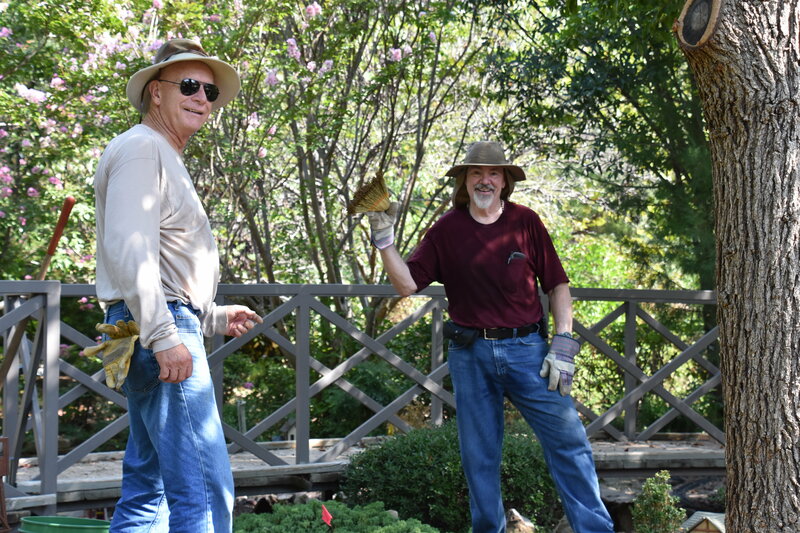 35th NATIONAL 2019 GARDEN RAILROAD CONVENTION, Portland, OR, 27th to 30th August 2019. Will you be there? Q: What do I need to do to lubricate my trains? What should I use? Where? Should old lubrication be removed? Should I use petroleum based products or synthetic? A: Although I have some experience in keeping trains lubricated, I asked Mike Pritchett for additional comments. His information is included in the answer below. All of the above need to be compatible with plastic. Conductive grease – This typically contains carbon which means that it is dirtier to apply. It is used when there is an electrical pickup attached to the sideframes of a truck (typically on an engine). You will need to place some in the journals on the sideframes where the axle enters the sideframe. The grease will provide for lower friction and will enhance the electrical connectivity. Failure to lubricate the journals will result in the ends of the axles and the journals getting worn excessively. This will result in a rougher ride and poor conductivity. If you use a non-conductive grease, then electrical conductivity will be reduced. However, non-conductive grease is preferable to no grease at all. Non-conductive grease – This is used inside gear boxes and is thinner (more liquid) than conductive grease. Enough grease should be used so that the driving and driven gears will be lubricated fairly rapidly once the engine is started. If non-conductive grease is not available, conductive grease or heavy gear oil may be used temporarily to avoid dry gears. If gears have been cleaned of old grease, then some heavy gear oil in addition to the non-conductive grease will help to spread the grease faster. Heavy gear oil – This is used on gears where it is not possible to use grease. Light oil – This is used on metal on metal contact surfaces such as the running gear on steam engines or axle bearings. It should also be used on cars where the axles enter the sideframes. Conductive lubricant (conductive oil) – This is used on electrical wipers to reduce friction and improve conductivity. The frequency of oiling and lubricating (greasing) varies with the type of equipment, the amount of running and with the weather. 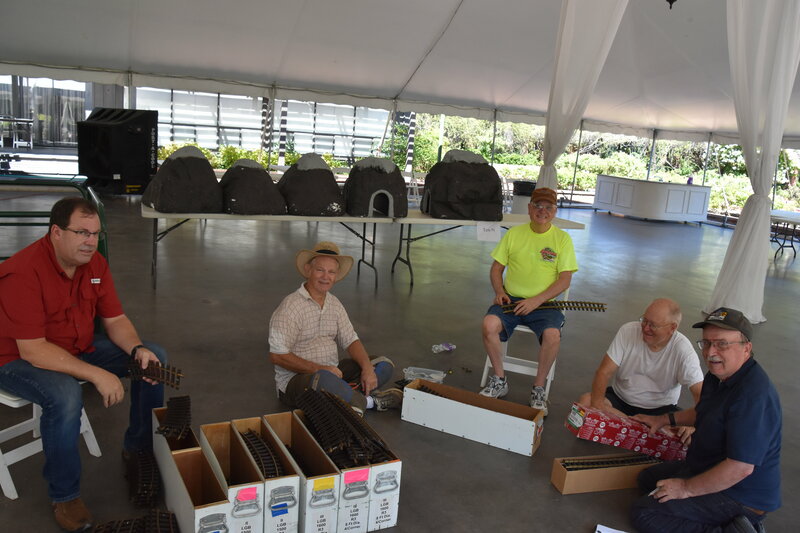 Checking the electrical pickups for heavy wear. When checking areas that are greased, you should look for dirt and other contaminates such as fine plastic burrs and brass dust. This type of contamination can cause premature wear and tear on gears and other parts. If there is more than a little contamination of the grease, it should be removed and replaced with fresh grease. To remove old grease you can scrape it off or use a plastic compatible solvent such as 3M brake cleaner or Dawn liquid soap. For rolling stock, you should examine the ends of the axles and the sideframe journals every 10 – 20 hours and oil (or grease) as necessary. As noted above, if you are using grease vs oil you should look for contaminates and if found remove the old grease before applying fresh. If you find that the end of the axle is significantly worn, you should replace the axle. Similarly if you find that the sideframe journal is more oval shaped than round, you should replace the sideframe. If you are running your equipment continuously for long periods of time, you should be checking your lubrication more frequently. Continuous running will result in a heat buildup which can create the need for more frequent lubrication. Similarly, if you are running in warm to hot weather, you should be checking your lubrication more frequently. As with long run times, higher temperature will result in a heat buildup which can result in the need for more frequent lubrication. An additional item to look at if you are going to be running for long periods of time, ie. 12 hours per day, seven days a week, is the bolster where the truck is joined to the car body. Generally, the truck frame and the bolster are both made of plastic and will wear over time. When the bolster is worn, the car body will ride closer to the wheels and may jam the wheels on curves. An additional problem that may occur is that the car may wobble excessively perhaps even to the extent of causing a derailment. A plastic to plastic lubricant such as Teflon or PTFE will slow down this wear. The differences of synthetic vs natural lubricants will be addressed later. That's a wrap for our September Newsletter. 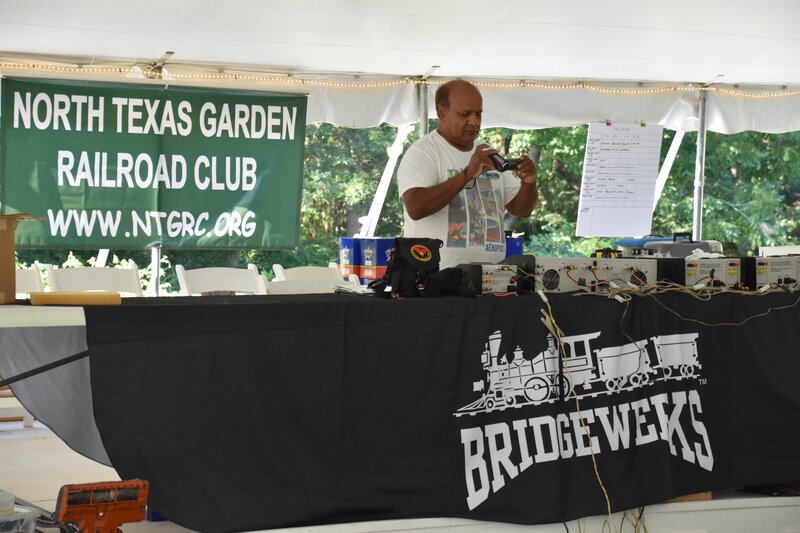 I hope to see many of our members at the Fall Plano Train Show next weekend. Thanks for reading.